How often do we choose sleep instead of prayer at the beginning of our day? After Jesus and the disciples retired to the Mount of Olives following their celebration of the Passover meal, Jesus said to them, “Pray that you will not fall into temptation.” (Luke 22:40) He then withdrew to pray about his impending passion. Even he was tempted to ask God to free him from the trial he was about to undergo, but then submitted to God’s will. Meanwhile, the disciples were not praying as he suggested, but had fallen asleep. He chastises them for sleeping and not praying, saying again, “Get up and pray so that you will not fall into temptation.” We know what happened next; they succumbed to the temptation of fear, and all of them scattered, abandoning Jesus at his arrest. Jesus invites us to pray just as he did the disciples. He invites us to begin our day with him and the Father. He knows from his personal experience that we will not be able to withstand the temptations we face each day without prayer. Prayer nurtures our relationship with Jesus and the Father. The temptations we face are many and varied — telling the boss what he wants to hear instead of the truth; getting angry when things don’t go our way; engaging in negative humor at the expense of others; flirting with a co-worker; overstating an item on an expense account; getting short with our spouse; or not spending time with our children at the end of a busy day. One of my more frequent temptations is to get impatient with a store clerk or the person on a help desk when their response seems to take too long or is off the mark. When I don’t pray, my pride’s expectations are often disproportionate to the problem at hand. With each temptation that Satan threw at Jesus at the beginning of his ministry, Jesus countered with a scripture that refuted Satan’s premise for the temptation. Prayer and scripture are weapons Jesus gives us against temptation and the wiles of Satan. St. Paul describes them as the armor of God and adds to them truth, righteousness, readiness, faith, salvation, and the Holy Spirit. (Eph. 6:13-18) To these, the Church adds the sacraments of reconciliation and the presence of Jesus in the Eucharist. This entry was posted in Uncategorized on March 23, 2015 by stevedalgetty1. How often do we ask God to free us from a difficult burden? It may be a serious illness, dealing with a rebellious child, satisfying a demanding boss, overcoming a hurt from a family member, or wanting to avoid the consequences of our own wrongful conduct. Getting free of the burden is usually our first priority. Even if we take the matter to prayer, our first prayer is likely that the burden be lifted. Even Jesus, in a demonstration of how real his humanity was, asked God before his arrest to take the cup of his impending trial, torture and execution, along with the crushing weight of taking onto himself all the sins of humankind. 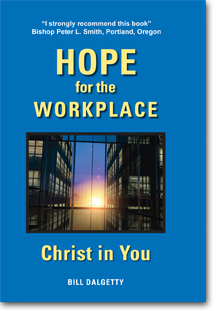 In Hope for the Workplace – Christ in you (www.zacchaeuspublications.com), there is the story of Bob, an insurance broker who made a substantial investment in a new company providing specialized insurance products, and then lost the entire investment due to the unethical practices of a partner operating the venture. A few years later, Bob read in the newspaper that the partner had been convicted of embezzlement in another business venture and sent to prison. Bob said, “I begin to sense that the Lord wanted me to go visit him in prison. My first reaction was, ‘No way!’ I was still angry with him for what he had done.” Yet, Bob was willing to let go of his will and submit to the Lord’s will, and make the visit. When he was released from prison, Bob gave him a Bible, invited him to a Christians in Commerce breakfast and continued to encourage him in re-establishing his life. When Bob submitted his will to God’s will, God transformed his unforgiving heart, and then used him to support his former colleague’s new life. Jesus said, “My food [sustenance] is to do the will of him who sent me and to finish his work.” (John 4:34) We worry and carry on about so many things in life. Yet, seeking God’s will in all matters might sustain us above all else. This entry was posted in Uncategorized on March 16, 2015 by stevedalgetty1. In all four Gospel accounts of the Last Supper, Jesus announces that one of the disciples will betray him. Luke reports that the chief priests were looking for a way to get rid of Jesus. “Then Satan entered Judas, called Iscariot, one of the Twelve.” (Luke 22:3) Judas goes to the chief priests and agrees to take money in return for betraying Jesus. What makes us vulnerable to Satan’s attack? Peter says, “Your enemy the devil prowls around like a roaring lion looking for someone to devour.” (1 Pet. 5:8) Like all predators, Satan attacks our weaknesses, bad habits and self-indulgences, inclining us to serve first ourselves instead of others. He inspires hurt that leads to anger and unforgiveness. His goal is to separate us from God whom he hates. The antidote to Satan and the putrid fruit he dispenses is accepting God’s offer to dwell in us through the Holy Spirit and embracing his example of death to self – the cross. This is impossible for us without God’s presence and grace. But as Jesus says, “With God all things are possible.” (Mt. 19:26) Many years ago, I met Jesus one evening and asked him to take the present sin and disorder in my life…and he did! It was truly a life-changing moment. James says it well when he exhorts us to “Resist the devil and he will flee from you. Come near to God and he will come near to you.” (James 4:7) Sin begets more sin. Grace begets more grace. This entry was posted in Uncategorized on March 9, 2015 by stevedalgetty1. Do you hold back your praise of God for the blessings and miracles in your life? All of creation had been awaiting God’s personal and physical visitation to make things right upon the earth. That visitation was now taking place in the person of Jesus of Nazareth, the Messiah, the Son of David, the King of Kings. Jesus is saying that if those who recognize his visitation and miracles are restrained in their joy and praise, even the stones, inanimate objects of creation, will cry out. As current day disciples, are we loud and joyful in our praise of all the good things God has done in our lives, or are we restrained in our cool and sophisticated ways? On a winter evening in 1977, I was prayed with for the release of the power of the Holy Spirit by some sisters from the St. Elizabeth Ann Seaton House of Prayer at an evening of renewal program in Briar Cliff Manner, New York. I experienced a visitation and personal encounter with Jesus Christ and my faith was renewed. It was a mountain top experience. I remember driving home in a blinding snow storm on the hilly and curvy roads of upper Westchester County, New York. I could hardly see beyond the hood of my car, but it didn’t matter, for I was brimming with joy and praise of God for his visitation and the changes that he was bringing about in my life. Even the blizzard, like the Pharisees, could not restrain my joy and praise. Today, with five older children and thirteen grandchildren, this space is not sufficient for me to acknowledge and praise God for all the miracles I have witnessed in my life. But if you will stay tuned into this blog, I promise that I will share some of the many blessings with you in the weeks ahead. Let us be loud and joyful in our praise of God for his presence and miracles in our life today! This entry was posted in Uncategorized on March 2, 2015 by stevedalgetty1.